Is it possible to get life under control? As a homeschool mom who is running her own business, I desperately need to get my to-do list under control. 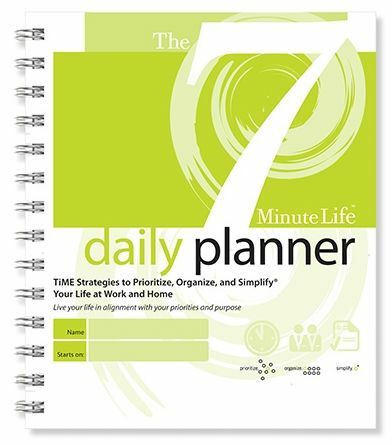 I was very excited to get the opportunity to try The 7 Minute Life Daily Planner from the 7 Minute Life. As our business has grown, it went from a learning experience for our son to a full-time job for me. So I have been trying to balance all my responsibilities, and it has been difficult. I have dropped the ball several times on some activities and responsibilities. I have felt really bad. I knew that I needed to make changes. The The 7 Minute Life Daily Planner ($24.95) has forced me to take a look at my daily activity choices. 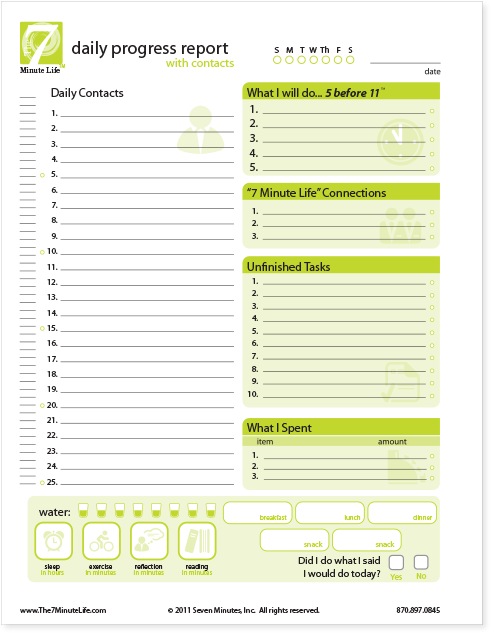 The 7 Minute Life Daily Planner is a printed planner that helps you to weed through that daily to-do list and become more productive in just a matter of minutes. It allows you to select and prioritize your day to really simplify your life and cut the amount of stress that you are feeling while trying to accomplish all that you need to complete. It helps you to set priorities. Avoid distractions and get your mind decluttered and set to work quicker. The author and creator of The 7 Minute Life Daily Planner, Allyson Lewis doesn't just expect you to buy the Planner and then figure it out yourself from there. She has created a full video series that helps you to learn each step in de-stressing your life and de-cluttering your daily to-do list. She wants you to succeed in managing your time better and freeing up more time for you to spend with your family or on something else that you enjoy. She has created many videos that explain to you how to succeed. She understands that every moment in family life is precious. So she worked hard to create the 7 Minute Life System. I was very excited to open the package with my planner. It is a wire bound planner with a plastic front and back cover. The front section of the planner contains all the information to get your started. It explains the best way to set your priorities. I really liked the point she made when she wrote, "You must consider carefully which daily activities and emotions you choose to spend your limited amount of attention on. You may be surprised to learn that you are squeezing out those things most important to you, while lavishing huge amounts of attention on unimportant things in your life." This line really spoke to how I had been feeling lately. I will admit that when I first opened this book, I was feeling overwhelmed. How many planners have you bought lately that provide tons of links on how to reduce the stress in your life? How many planners really open up on how to use them to their fullest extent and try to lessen your work load? The 7 Minute Life Daily Planner is packed full of information on how to establish your goals, make life connections, tackle unfinished tasks and take care of the mental clutter that we all feel daily. It took me a couple days to read through the first pages of The 7 Minute Life Daily Planner. There is a section where you create a list of your priorities. You also need to dig deep and look at what you think your purpose in life really is. The stress I have been under has caused my autoimmune issues to flare up and this made these activities a little tough for me to complete. But I did make my way through. That also made me open my eyes to what is cluttering my mind. You need to take a look at the mental clutter you are dealing with and what actions you need to take to help with this. There is also a section on setting short term and long term goals for your life. You can list what actions you need to take to make it through completing those. A midst all of these tasks, you will also find the typical monthly calendar section. I do with there were some tabs already on these pages, so that I could quickly flip between sections. But I was able to easily add my own tabs to these areas for quick reference. Each daily page has been created to help work toward your goals and lessen your work load. This planner really does turn into your "entire" life record. 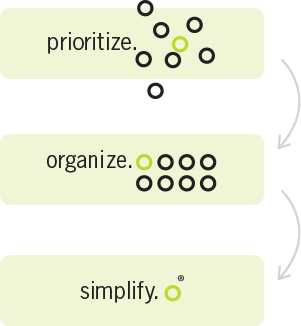 There is a section on the "5 before 11", which are 5 tasks that you complete daily before 11 am. You decide daily which tasks you want to make a priority each day. There are spaces for make notes on voice mails you receive, spending habits, eating/drinking habits, thank you notes you need to write, and of course and appointment area and extra lines for making notes each day. I have been using The 7 Minute Life Daily Planner for a few weeks now. I have enjoyed the information and suggestions that I read about. I have been noticing that I need to make family activities a priority and to lessen the distractions that have been happening. "In a minute" cannot be an acceptable response to the kids all the time. Certain sections of the planner pages really were not applicable to me. I do work full-time, but do not need an entire section for voice mail notes. I don't always meet people in person or sometimes I do not even talk with new people daily. So I made the connections section to also include email correspondence that I have with people. I felt that some sections did not fit me completely, but I really did enjoy the layout of the planner. I enjoyed learning new ways to step back and look at my true priorities. I am still using The 7 Minute Life Daily Planner. I did notice my confidence grew as I started looking at making sure I do complete the tasks in my "5 before 11" challenge. It's the little things like that daily that kept me going. I am definitely a work in progress though. I am not giving up on the planner and I and working hard at continually using the planner to the fullest extent. I have some times where I lapse on keeping up with my "5 before 11" tasks or making my daily connections. I find myself actually caring though that I am using this planner. Unlike other planners in the past, I carry The 7 Minute Life Daily Planner with me. I keep it open on my work area. I am planning ahead. I am working on setting the priorities of the day and the week. Daily I keep listening for those opportunities to spend time with the family because I finished the most important 5 tasks of my day. I will continue using The 7 Minute Life Daily Planner. In My Opinion, The 7 Minute Life Daily Planner is priced economically and if you are struggling the way I have been the last few months, it has been a great help to point me in the right direction. It is baby steps for me, but with the help of the 7 Minute Life, I will hopefully continue to make bigger strides in my organization and ability to stay on task. Which will help lessen the stress in my life, and keep me from missing important appointments and due dates, as well as important family Time. Several members of the Schoolhouse Review Crew had the opportunity to try out The 7 Minute Life Daily Planner. Please take some time to see how well this planner worked for them in their family.